Ramblers have launched a campaign to help improve Cornwall's 6,000 public footpaths, 60% of which have been classed as unusable. A survey by Cornwall County Council in 2004 logged 16,000 problems in 2,800 miles (4506km) of footpaths, including 4,000 unlawful blockages of paths. The council has since begun a three-year, £2m repair programme to the worst affected public footpaths. The Ramblers Association is asking walkers to report all problems. It is also calling on walkers to use Section 130A of the 1980 Highways Act in which people can serve notices on authorities to remove path obstructions within 28 days. Nearly 3,700 signs are missing and 3,000 stiles are broken according to the 2004 survey carried out by consultants for the county council. The path network was identified as the worst in the country in the Audit Commission's annual 2005 league table of county council performances. 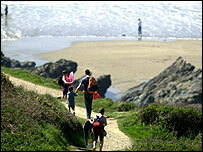 In Devon, 90% of footpaths are classed as easy to use, compared to 41% in Cornwall. It is estimated that the cost of restoring the complete path network could total £6m. The current cost of maintaining a network like Cornwall's is about £1.3 million a year. The county council has responsibility for the management and maintenance of routes. The regional footpath spokesman for the Ramblers Association said: "The council needs a long-term strategy and long-term funding to solve the problem."